What was Global Learning Across Indiana? From 2012-2016, Indiana University and Ivy Tech Community College partnered to support curriculum internationalization and Arabic instruction across Ivy Tech’s curriculum. Supported by a U.S. Department of Education’s Undergraduate International Studies and Foreign Language (UISFL) grant, GLAI worked with 20 faculty each year. Dozens of courses were redesigned, a statewide global learning certificate was created, and programs for Arabic language instruction were set up across Ivy Tech’s 13 regions. 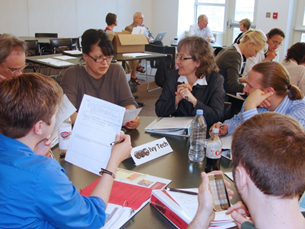 The GLAI partnership began in 2012 with a smaller scale, four-year collaboration between Indiana University Bloomington (IUB) and Ivy Tech Bloomington called the Internationalization Collaborative Across Bloomington (ICAB). The project directors of GLAI were Dr. Rebecca Nickoli, Vice President for Corporate College Services at Ivy Tech, and Dr. Hilary Kahn, Director of the Center for the Study of Global Change at the Indiana University School of Global and International Studies. Cigdem Balim Harding, Associate Director of the IUB Center for the Study of the Middle East, guided the development of the Arabic curriculum, and Dr. Michelle Henderson was the GLAI Project Coordinator.